Finally, the two greatest Draculas are together in one film. It is a posthumous collaboration between Bela Lugosi and Sir Christopher Lee, but that is all the more fitting. Many of the greatest voices in horror cinema bring to life five classic Edgar Allan Poe stories in Raúl García’s Extraordinary Tales (trailer here), which opens this Friday in New York. Between 2004 and 2014, former Disney animator García unleashed his inner fanboy producing a series of Poe short films that paid tribute to the dark bard of Baltimore, as well as other icons of classic horror cinema and graphic art. They are now finally collected and connected by a framing device naturally set in a gothic cemetery. Poe’s spirit now resides in a raven, but an anthropomorphized Lady of Death tries to convince the writer to accept his final resting, by using his own stories as grim object lessons. The figures of García’s interstitials and the first tale, The Fall of the House of Usher, are a bit blocky, but the backgrounds are wonderfully atmospheric. Usher is also stratospherically elevated by the late, great Sir Christopher’s drippingly macabre narration. He sounds as sonorously sinister as ever, which make Usher a delight. However, for classic monster fans, nothing can top García’s The Tell Tale Heart, which was Oscar short-listed as an animated short in 2005. Using a non-professional proof-of-concept recording taped by Lugosi’s agent in the late 1940s when he was trying to package a Poe-themed stage show, García truly taps into the psychologically perverse essence of the story. Rather than phoning it in, Lugosi fully draws out all the twisted drama. With all its hisses and pops, it rather appropriately sounds like some sort of ghostly spirit broadcast. 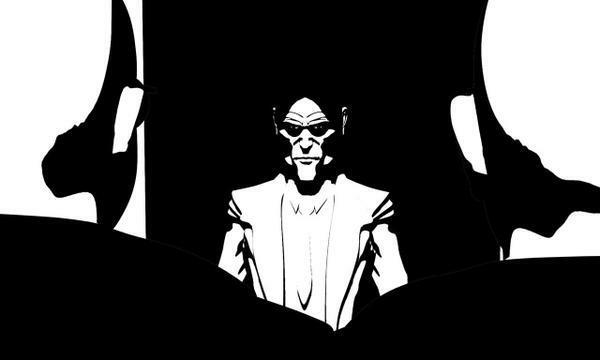 Visually, García’s stark black & white animation, conceived as an homage to Argentine comic artist Alberto Breccia, is also absolutely arresting. Julian Sands does not exactly have the same stature, but the Warlock and Arachnophobia actor is certainly no stranger to a horror movie set. His narration for The Fact in the Case of M. Valdemar is right on the money, yet he is completely up-staged by García’s visuals. In this case, he renders the story in a style that evokes the pulpy look of EC Comics. It is definitely cool looking, but the master touch is the mesmerist narrator, who bears a surely not coincidental resemblance to Vincent Price. Frankly, Guillermo del Toro is not a natural born voice-over artist, but the Mexican auteur sounds duly authentic narrating arguably the most faithful English language adaptation of Spanish Inquisition-set The Pit and the Pendulum to date. In fact, the entire film remains remarkably true to Poe’s source material. The expressionism of Pit also makes it one of García’s most sophisticated looking and psychologically engaging tales. With The Masque of Red Death, Extraordinary ends on a mostly wordless high point. Roger Corman himself, the self-made mogul who helmed all the great Poe adaptations starring Price, has only one line of dialogue as Prince Prospero, but it is worth the wait. Instead of chatter, García builds tension and foreboding by showing the silent figure of death glide through the Prince’s hedonistic bacchanal. García has truly assembled a horror connoisseur’s dream team by incorporating the work of Poe, Lugosi, Lee, Corman, del Toro, and sort of Price and Breccia into one enormously satisfying film. Even though it is distributed by GKIDS, Extraordinary Tales might be too intense for youngsters, but kids old enough to stay up for Corman classics on the weekends should enjoy its spookiness. García maintains an impressively eerie mood, but older fans might just get caught up in nostalgia for our old midnight movie idols. Either way, it is thoroughly entertaining film. 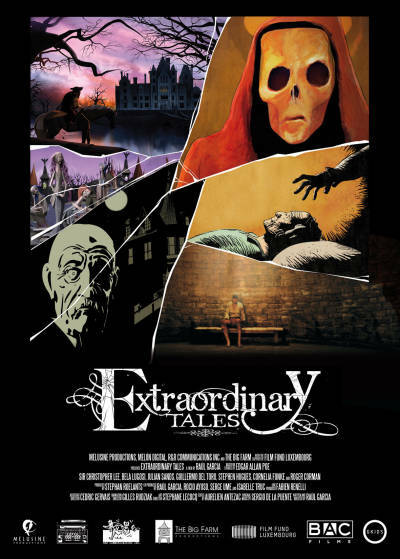 Highly recommended for horror and animation fans, Extraordinary Tales opens this Friday (10/23) in New York, at the IFC Center.